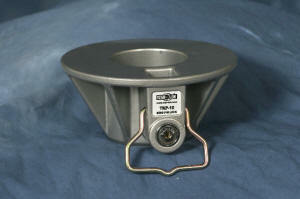 The TKP-10 is a highly effective king pin lock designed for dropped trailers. The conical-shaped lock is lighter then most high-end king pin locks and wide enough to deflect the fifth wheel plate of a would-be thief semi. The TKP-10 comes standard in powdered-silver for color. Also, we can also provide this item with a variety of colors & keys to let you mark trailers for loading or pick-up at your dock.